MARTINSBURG, W.Va. – From a very early age individuals are taught the right way to behave, and with the ever-increasing prevalence of smartphone usage, it is also important for wireless consumers to learn how to mind their mobile manners. 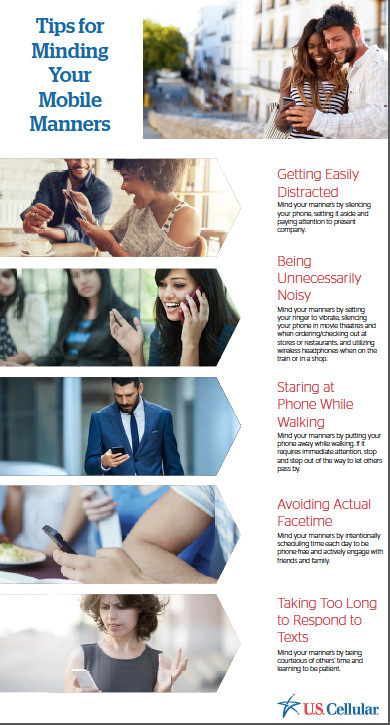 According to Pew Research Center, a third of Americans live in a household with three or more smartphones,1 and 26 percent of adults admit to being online almost constantly.2 In recognition of National Cellphone Courtesy Month, U.S. Cellular is sharing a few insights on device etiquette and how to improve interactions with others. • Getting Easily Distracted – It can be hard to pay attention to people when messages and status updates are constantly being received. In fact, 20 percent of those surveyed admit to checking their smartphones every few seconds/minutes. Yet, more than 60 percent of respondents think it is rude to check a phone during a conversation or while dining with others.3 Mind your manners by silencing the phone, setting it aside and paying attention to present company. If awaiting an important call or email, be upfront about it and apologize in advance for the distraction and possibility of needing to be excused. • Being Unnecessarily Noisy – Ironically, today’s smartphones are more highly utilized for texting and entertainment than making phone calls. In fact, consumers text at a rate almost four times the number of calls made and received per day.3 Though phone calls occur less frequently, they may still be irritating to others. This rings particularly true when the volume is high, calls are accepted at inappropriate times and conversations are had on speakerphone while in public. Mind your manners by setting the ringer to vibrate; silencing your phone in movie theatres and when ordering/checking out at stores or restaurants; and utilizing wireless headphones, like Beats Powerbeats 3 Wireless Earphones, when on the train or in a shop. • Staring at Phone While Walking – Sometimes multi-tasking is a must; however, 59 percent of smartphone owners get annoyed by people who use their device while walking. And rightfully so, as 33 percent of U.S. Cellular survey respondents have had someone walk into them because they were on the phone. Interestingly, 19 percent of respondents admitted to having personally walked into someone or something while on the phone.3 Mind your manners by putting the phone away while walking. If it requires immediate attention, stop and step out of the way to let others pass by. • Taking Too Long to Respond to Texts – U.S. Cellular survey respondents reported sending 19 texts per day, and 71 percent said the expected response time after sending a message should be within minutes. So, it’s not surprising that most smartphone owners (53 percent) get annoyed when others take more than an hour to respond to a text.3 Mind your manners by being courteous of others’ time and learning to be patient. • Avoiding Actual Facetime – Nearly half of all smartphone users admit they sometimes use their phone to avoid conversation. Meanwhile, more than 30 percent of U.S. Cellular survey respondents wish children and significant others would talk rather than text, email or instant message.3 Mind your manners by intentionally scheduling time each day to be phone-free and actively engage with friends and family. 1http://www.pewresearch.org/fact-tank/2017/05/25/a-third-of-americans-live-in-a-household-with-three-or-more-smartphones/ 2http://www.pewresearch.org/fact-tank/2018/03/14/about-a-quarter-of-americans-report-going-online-almost-constantly/ 3 Between Nov. 8-17, 2017, a total of 706 online interviews were conducted among a nationally representative sample by Consumer Insights, in partnership with Maritz CX. About U.S. Cellular U.S. Cellular is the fifth-largest full-service wireless carrier in the United States, providing national network coverage and industry-leading innovations designed to elevate the customer experience. The Chicago-based carrier offers coverage where the other carriers don’t and a wide range of communication services that enhance consumers’ lives, increase the competitiveness of local businesses and improve the efficiency of government operations. For the fourth time in a row, U.S. Cellular has the Highest Wireless Network Quality Performance, according to J.D. Power’s twice-annual U.S. Wireless Network Quality Performance Study, and 99 percent of customers have access to 4G LTE speeds. To learn more about U.S. Cellular, visit one of its retail stores or http://www.uscellular.com. To get the latest news, promos and videos, connect with U.S. Cellular on Facebook.com/uscellular, Twitter.com/uscellular and YouTube.com/uscellularcorp.